2771 PHILIPP HAPPACHER IN WIEN. AN EXCEPTIONAL TWO MONTH DURATION SECONDS BEATING MAHOGANY LATERNDLUHR BY THIS FAMOUS MAKER. CIRCA 1825. An exceptional mahogany Laterndluhr. The full length case, with ogee moulded pedimented roof, has the typical lift off hood with opening front door and an unusual angled moulding leading into the trunk of the clock which is relatively narrow. 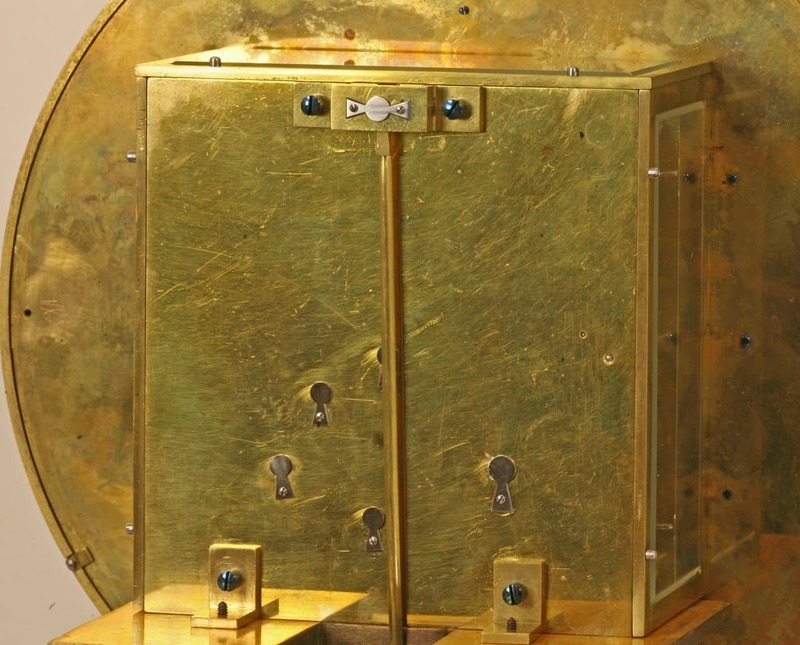 The bottom pendulum box has a lift out front door and the typical under curved base. The hood, trunk and pendulum box all have glazed apertures at the side, as well as at the front. 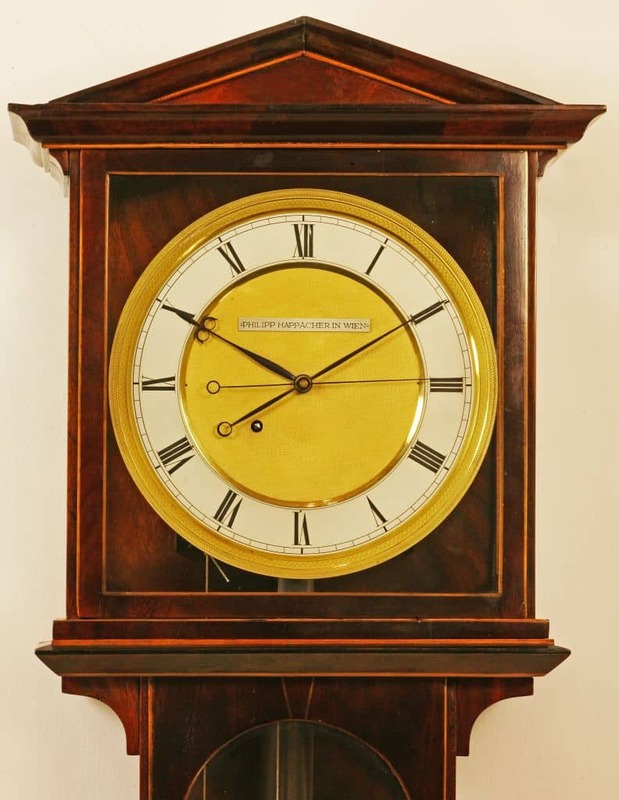 The whole clock is strung with boxwood stringing and has fine quality mahogany veneers. 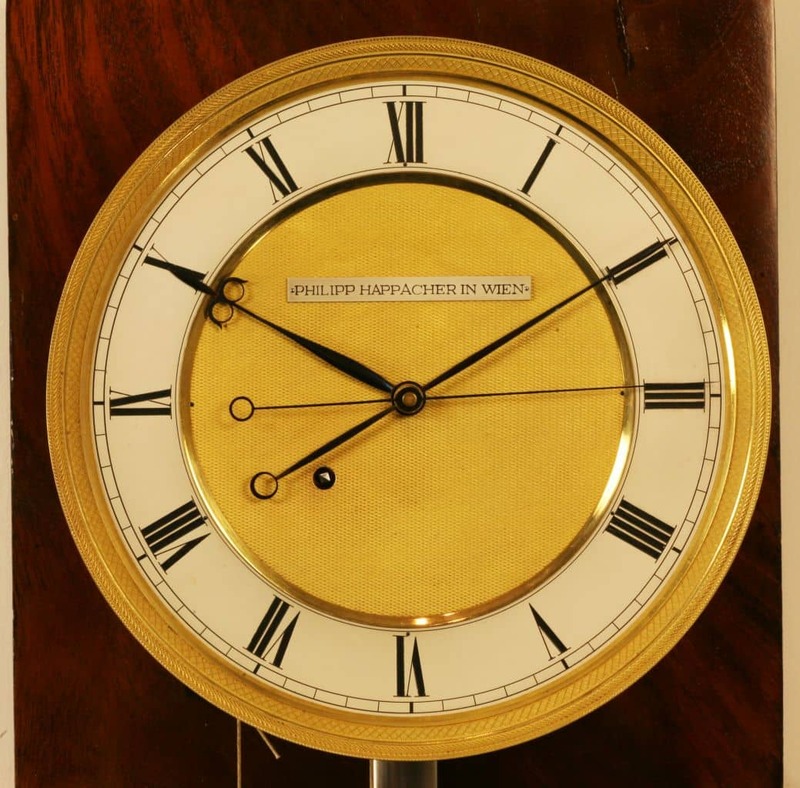 The two piece dial of the clock is in the finest style. It has a silvered brass chapter ring with Roman numerals and an outer minute ring, and an engine turned gilded centre. There is a signature plaque below XII reading ‘Philipp Happacher in Wien’. The winding whole is offset to the left. The fire gilded engine turned bezel has exquisite detailing and is larger and more deeply dished than normal. The blued steel hands are in the beetle and poker style and are of fine quality. The centre seconds hand is very thin and fine with a moon shaped counter balanced end. The two month duration movement is beautifully executed and unusual. 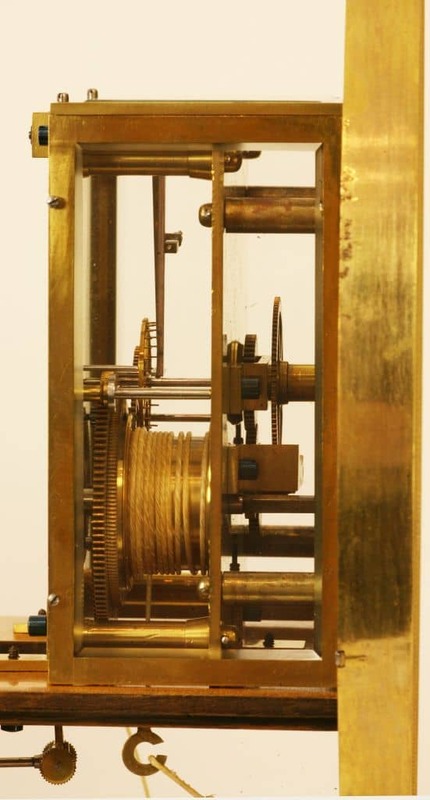 It is fully glass enclosed and has a pin wheel deadbeat escapement connected to the centre sweep seconds hand. It has maintaining power and the backplate has end stops which also act as dust covers. The steel rod pendulum is knife edge suspended from the backboard and has a heavy lead filled bob which fills the bottom of the case. The large brass weight runs to one side of the case. Philipp Jacob Happacher was born on the 13th September 1784 in Friedberg (Germany). He was the son of a clockmaker, Bartholomäus Happacher, and Afra Happacher nee Huber. He was married on the 31st May 1812 to 28 year old Catharina Pentenrieder nee Aichach in Bavaria. She was also the daughter of a clockmaker, Martin Pentenrieder. Philipp’s witness was the clockmaker Ignatz Happacher (1809-1817). In 1812 Philipp lived at No 8 Alservorstadt. On the 16th March 1816 he obtained the Order of Masterpiece and in 1818 he became a citizen of Vienna. On the 17th July 1818 Philipp became Master. He died in Vienna on the 19th October 1843 and was interred in the Cemetery of St Marx on the 21st December 1843.